May this coming year be filled with magic and dreams and good madness. May you read some fine books and kiss someone who thinks you’re wonderful. May you make some art – write or draw or build or sing or live as only you can. And somewhere in this coming year, may you surprise yourself. President Mary Straus opened the meeting by yielding the floor to PDG Randy Brooks, who told us about memory screenings being conducted by the Alzheimer’s Prevention Foundation. Randy is Vice President of this association, and the screenings are being carried out in Nogales. Webmaster Harold Burtzloff announced that you can now reach our website by typing in maranarotary.org. Really! It must be true – persistence really does pay off! And Matus Bogar brought some wonderful Slovakian treats for all of us. Thank you Matus. More chocolate! Randy Brooks will be singing at Café Tremolo to benefit our Club, at 6pm. Mary will host an event with former DG Sally Montagne, who is coordinating a global grant for Children Peace in Africa. This will be at Mary’s home. Dan Contorno, who is working hard on our upcoming Tour de Cookie fundraiser, announced that Cindy Dooling, better half of our very own John Dooling, was able to secure parking for Tour participants at the PCC on Shannon Road. That is now the start of the Tour! The inimitable Sulee Edwards challenged us this week on our knowledge of Rotary and on how we would formulate a New Year’s Resolution for our Club. We were asked nine questions about Rotary in honor of Rotary Awareness Month. Our winner, who got every answer except one correct, was Secretary Jo Holt. What did she not know? That the largest annual public relations project of Rotary Clubs in the US and Canada was….the Rotary float in the Rose Parade! In addition to our Club’s New Year Resolution, Sulee asked us to write our suggestions on big sheets of paper on the wall. Most thought that was fun. Harold did not leave his seat, however, and shouted out his responses to someone else to write down. Harold, you are the WEBmaster, not the TASKmaster. Thank you Sulee, for an informative and entertaining lesson in self-reflection! 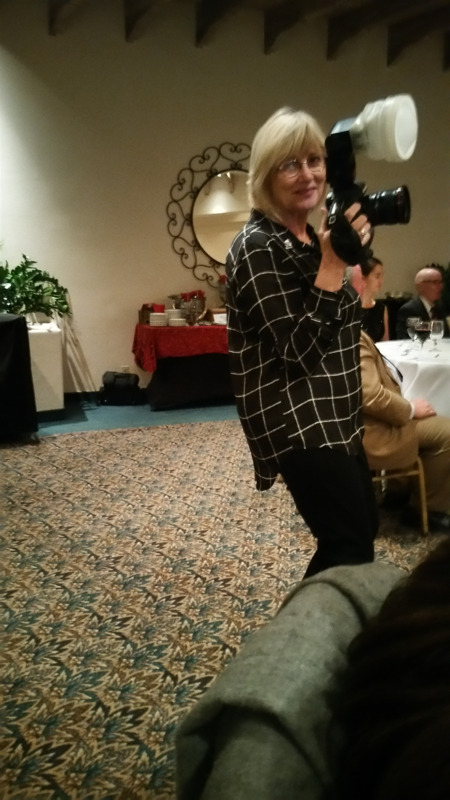 Photo of Sulee doing her photo thing at the Foundation dinner last fall. Catch her if you can!